Today is my seventh blogoversary. Hooray! We celebrated by having a system crash this morning, which is kind of appropriate in a way. After seven years, I have yet to work on a truly reliable blogging platform. But an even more appropriate way to celebrate is by putting up some bonus catblogging. So here it is: a picture of Inkblot snapped three minutes ago. If I had a cat-cam set up in my living room, this is what you’d see in real time. In fact, it’s what you’d see most of the time in real time. And if I had a people-cam set up in my study, you’d see me staring at a glowing screen and typing some words into a box. Which is also what you’d see most of the time. 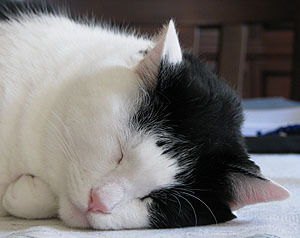 In other words, if you substitute “blogging” for “snoozing,” I’m an awful lot like a housecat. Funny how that works.